Voters' ballots are still secret, but technology is helping political parties get a pretty good idea who will vote, how they'll vote and the best way to make sure they vote — long before people actually head to the polls. The Democratic and Republican parties both are collecting information about millions of individual voters, a key ingredient in their 2004 campaign game. The close 2000 presidential election showed how important getting even a fraction more of a party's supporters to the polls can be. The Democratic National Committee has "DataMart," a new 158-million-record database of voter information connected to "Demzilla," which tracks and manages party contact with donors and activists. The Republican National Committee has a 165-million-name database called "Voter Vault." "We can tell you exactly which house on which street we need to get out the vote, because we know that the issues they are concerned about are Democratic issues," party Chairman Terry McAuliffe said. "And we know what to say, and we know what not to say." The DNC has 306 pieces of information attached to every name, he said. In addition to its value in get-out-the-vote efforts, the data the parties accumulate helps fund-raisers, who can use it to spot voters who identify with a party but haven't yet donated to it. It also can help parties lavish special e-mails, direct mail and phone calls on small-dollar donors, who have become even more valuable now that the campaign finance law has banned corporate, union and unlimited individual donations. The Democratic Party's database includes Census data, such as block-level demographic information; national consumer data, which provides individual details such as whether a person is married, owns a home and has children; voter files, which are available from several states and show a person's party identification and which elections he or she has voted in; and rundowns on how precincts voted in past elections. The Republican National Committee declined to say what kind of data Voter Vault has. Frank Fahrenkopf, who made developing voter files a priority when he was RNC chairman in the 1980s, said technology has come a long way since then. Before user-friendly data and databases, the RNC obtained hunting and fishing license lists on computer tapes from the states, figuring outdoor-sports enthusiasts would be receptive to the party's message. "We would compose special letters from President Reagan to them dealing with issues of hunting and fishing and outdoor life and so forth. So we were targeting the message," Fahrenkopf said. The party also had special mailings and get-out-the-vote efforts for people living near military bases, figuring anybody within three miles of a base probably lived or worked on it and tended to be conservative, he said. In key states, the party would get state lists of registered voters and driver's license holders. It would use them to produce a list of people of voting age who weren't registered to vote and who lived in neutral or Republican districts. "We would then rent a warehouse and put in 50 phones and we would call these people," Fahrenkopf said. The callers would ask who they were likely to vote for, and if they said Reagan, the callers would say the party noticed they weren't registered to vote, and could they send someone out to register them. On Election Day, the party sent representatives to polling places carrying lists of the voters it had registered; if those voters didn't appear, party workers would call and ask if they needed a ride to the polls. The program wasn't cheap, Fahrenkopf said, but it was effective. Now, thanks to the Internet, the parties can easily find out from voters what they're interested in, provide them with voter registration information and deploy them as volunteers in massive get-out-the-vote efforts. 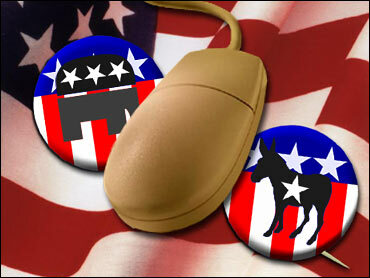 E-mail and Web sites allow them to communicate with supporters instantly and at little cost. The GOP committee calls its e-activist effort the "Team Leader" program, and gives those who sign up more than 30 different teams to choose. Some are based on race or ethnicity, such as the African American, American Indian or Lebanese American teams. Others represent religious affiliations, professions and interests, such as the Catholic, Evangelical, High-Tech, Home School or Snowmobiler teams. More than 340,000 people have signed up. The party uses the information provided to organize and communicate, RNC spokeswoman Christine Iverson said. "Without divulging any trade secrets, we're very confident we have state-of-the-art methods of identifying and turning out Republican voters," she said.